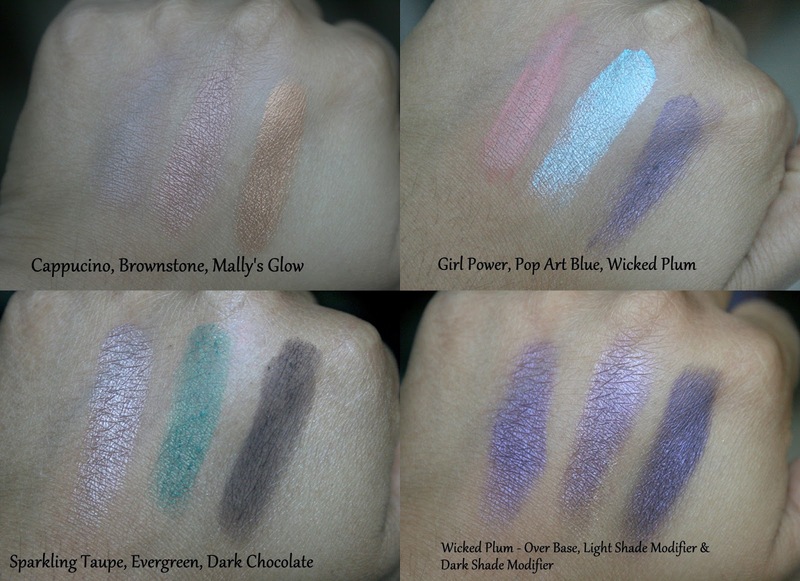 Mally Beauty's pro-tricks eye shadow palette is a fairly new launch and a qvc-exclusive palette that features six eye shadows, along with a primer, light shade modifier and a dark shade modifier that helps create custom looks. The dark shade modifier is an inky black base and the light shade modifier is a light, shimmery champagne color. As much as I like the concept behind the dark and light shade modifiers, I do wish that the eyshadows themselves, especially the green and plum shades were a tad less chalky. They are quite pigmented and there isn't much fallout, but the textures aren't so blendable. The palette also includes a fluffy eye shadow blending brush - its nice to have and helps achieve good wash of color. The bases are quite sticky, which is a good thing and that helps the eye shadows adhere to them better. The 'dark shad modifier' is quite a nice concept - I tend to use a lot of black or brown bases for my less pigmented shadows to deepen the color a little more and that it is included in the palette is nice.There's a protective covering for the base that keeps the colors from mixing in. Overall, I think its tad expensive for the price - the shadows are a good size and the mix of colors are really nice, but I wish they blended a little better. I really like concept of including shade modifiers to deepen, lighten and customize colors, but it would have been better if the textures were a tad more forgiving. Have you tried the Mally Beauty Pro-Tricks Eye Shadow Palette? Ooh the blue is pretty! I like the purple shades too.